TURQUOISE FLORAL PENDANT/BROOCH of flameworked glass and fabricated sterling silver, 7 centimeters diameter, 2016. Photograph by Dean Powell. After extensive renovations, the Renwick Gallery of the Smithsonian American Art Museum reopened this past July with a stellar showcase of objects from its permanent collection. “Connections: Contemporary Craft at the Renwick Gallery,” which is ongoing, offers eighty-plus eclectic and engaging examples of craft art, from the Eames brothers’ plywood Leg Splint, 1942, to Judith Schaechter’s stained glass The Birth of Eve, 2013. Curated by Nora Atkinson, the Lloyd Herman Curator of Craft, the exhibition works by association rather than by chronology, seeking to emulate today’s hyperlinked world. 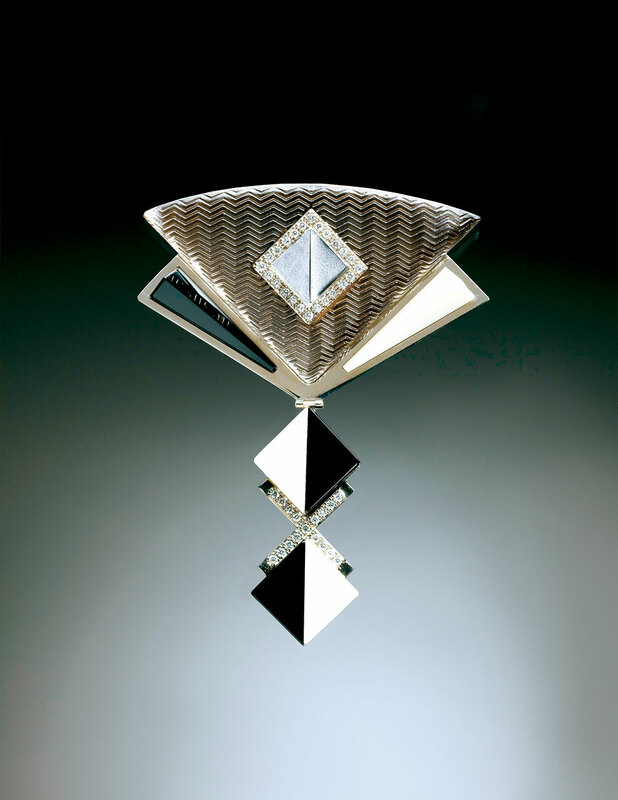 Kristina Logan is represented by a brooch/pendant featuring a pattern of cobalt and silver accented with a ring of sterling dots. 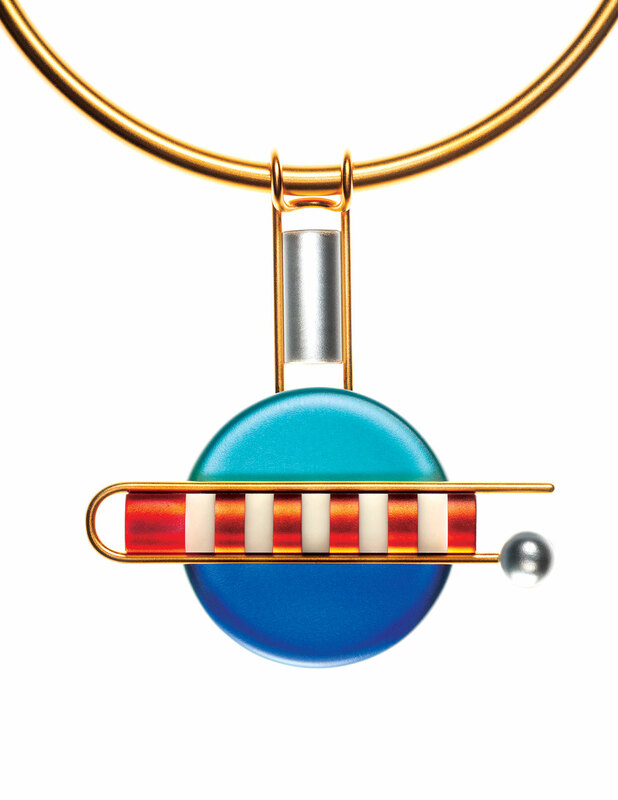 The lampworked soda-lime glass and sterling silver piece, made in 2001, is displayed alongside Alexander Calder’s undated hammered copper Necklace. In a video produced for the show, Logan speaks about Calder and their aesthetic ties. She loves how he used simple materials and created value “by infusing them with creative energy, ideas and careful mark-making.” Glass, like brass and copper, she notes, “has little intrinsic value, but it is the artist’s hand and spirit” that can give them worth. Logan’s appearance in the Renwick show comes as no surprise: over the past twenty-five years, she has become one of the foremost glass bead artists in the world. Her work is in major collections, including the Museum of Fine Arts in Boston, and she has earned special recognition in her field, including the title “Dot Queen”—for the marvelous array of dots that accent her beads. Certain of Logan’s designs, such as the Constellation necklace and the Cactus bead, are icons of contemporary beadwork. Her brooches, pendants, rings, and necklaces mesmerize. Kaleidoscopic disks set in sterling silver dazzle the eye. COLLECTION OF TOTEM BEADS of flameworked glass, largest bead 10 centimeters long, 2000-2003. Photograph by Dean Powell. Having started out making single beads, today Logan is the creator of reliquaries, candlesticks, goblets, teapots, chalices, and other objects that incorporate her beadwork. She is increasingly interested in pushing the boundaries of scale while retaining her intricate details. She is currently finishing up several statuesque drinking vessels inspired by eighteenth-century Nuremberg goblets she discovered in the Corning Museum of Glass. While the profile of her lidded goblets are similar to those early ones, the flameworked, pâte de verre and bronze pieces are “incredibly different” on a tactile level. One of them was featured in the recent exhibition “Beginnings” at the Corning Museum of Glass. When asked about the evolution of her designs, Logan admits to progressing in geological time—very slowly. If you were to look at her beads today alongside ones she made early on, you would be able, she avers, to see the lineage. She does make drawings—of the brooches and metalwork—but the bead designs arise from experimentation. Once in a while an idea will come to her when she is not looking for it, at three in the morning, but ninety-nine percent of the time it happens when she is in the studio. She believes the constant pattern of work brings ideas. “I believe in that preparation,” she has stated. The concentration that comes with deadlines helps spur the work forward. GOBLET of glass, bronze, silver, steel, lost wax cast and flameworked glass, cast bronze, 11.43 x 11.43 x 33.02 centimeters, 2016. Photograph by Bill Truslow. 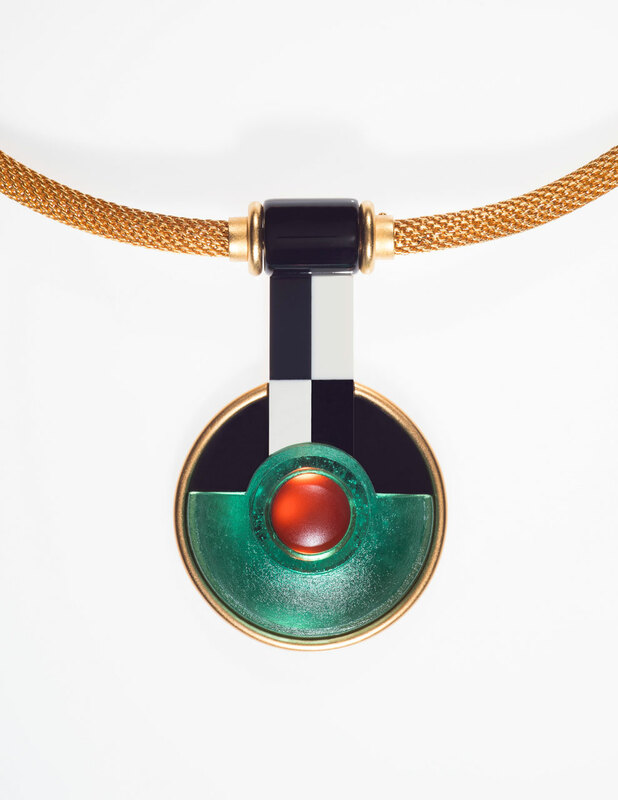 Logan’s beads are marked by opaque and transparent layers—“That’s how I find color,” she says. Starting with a “Crayola box of all the colors,” she uses layering to play subtle variations on the palette, thereby altering the design from piece to piece. She relishes this exploration of tint and shade and hue. Early on Logan was not always comfortable with color, and has noted, she “may have been afraid of it.” It was not the color in flameworking that interested her so much as the fluidity and movement of melting glass. Logan likes working in series, “beading an idea to death,” she says with a smile, until she gets it right. She loves the refining process, a “precision” that comes “from hours and hours of going back over the same concept again and again,” deepening the vocabulary along the way. While she admires artists who can jump ideas, it is not in her DNA to work that way. Architectural detail has been an important inspiration, be it East Indian doorways, Moroccan tiles, or mosaics from the pre-Renaissance and Renaissance. European reliquaries from 1300-1500, the bronze armatures found in Louis Comfort Tiffany’s work—these also inspire, as do patterns in nature. One collection of brooches got its start after Logan came across a book on ancient shields of Africa, South East Asia and Oceania from the Barbier-Mueller Museum collection in Geneva, Switzerland. Logan has made it her mission to challenge the stereotype of bead jewelry, namely, beads strung together or with knots between them, like a string of pearls or a rosary. 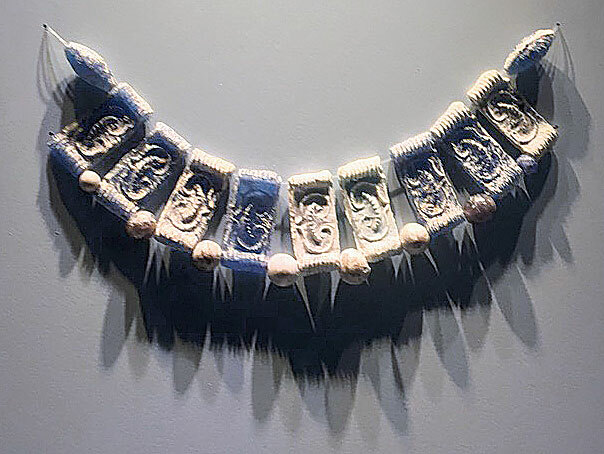 She is committed to connecting beads with metal in a way that is nontraditional, that “counteracts that idea of stringing.” To that end she cuts, drills and grinds her beads, in the process taking them to a new place in the realm of ornament. She is an innovator. COLLECTION of large disk beads in flameworked glass, 5.08 centimeters diameter, 2016. Photograph by Kristina Logan. 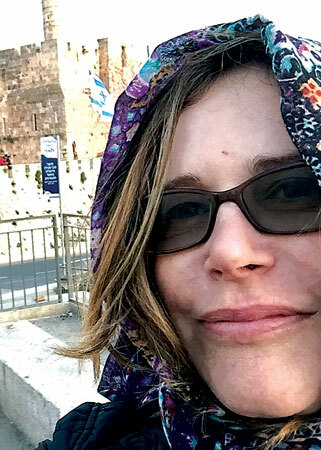 Kristina Logan was born in Worcester, Massachusetts, but spent much of her early life in New Hampshire’s White Mountains; she considers the Plymouth/Waterville Valley area her home. She boasts significant artistic genes, especially when it comes to working with her hands. Her mother, Reg Logan, née Surette, was a fashion illustrator at a time when newspaper and magazine advertisements were hand-drawn; today, she makes insect jewelry and ceramic objects. Logan’s grandmother, Reggie Surette, also worked in illustration, hand-drawing and -coloring for the Rust Craft Greeting Card Company, while her grandfather, Eliot Surette, did restoration in churches in the Boston area. Growing up in this artistic milieu Logan recalls thinking that she, too, would draw for a living. In turn, she tells her own children, nine-year-old Valère and twelve-year-old Sophia, that she can tell that they already have the family hands. One of her necklace designs, a lively and playful collection of round beads, is named for her daughter. Logan earned a BFA in sculpture at the University of New Hampshire in Durham in 1987. The all-star faculty included painter John Hatch (1919-1998), printmaker and draftsman Sigmund Abeles, and sculptor Michael McConnell (1948-2012). She appreciated the focus they placed on the foundations for making art—and their stories of life in New York City. She ended up embracing 3-D and carving in wood, sometimes with a chainsaw. One night while attending Pilchuk Glass School, Logan spied someone flameworking. She remembers thinking, “Oh, man, you mean I can do glass by myself? Without an enormous studio?” While she appreciates the sense of teamwork found among a group of glass blowers, she prefers working alone. As she noted in a 2009 interview, she likes the feeling of being self-reliant. For a time Logan sold individual beads that other people would use to make jewelry. She attended bead shows, loading up her Volkswagen van and hitting the road. It afforded her a modest living and was “very empowering.” After a while, however, she wanted to make something out of the beads. 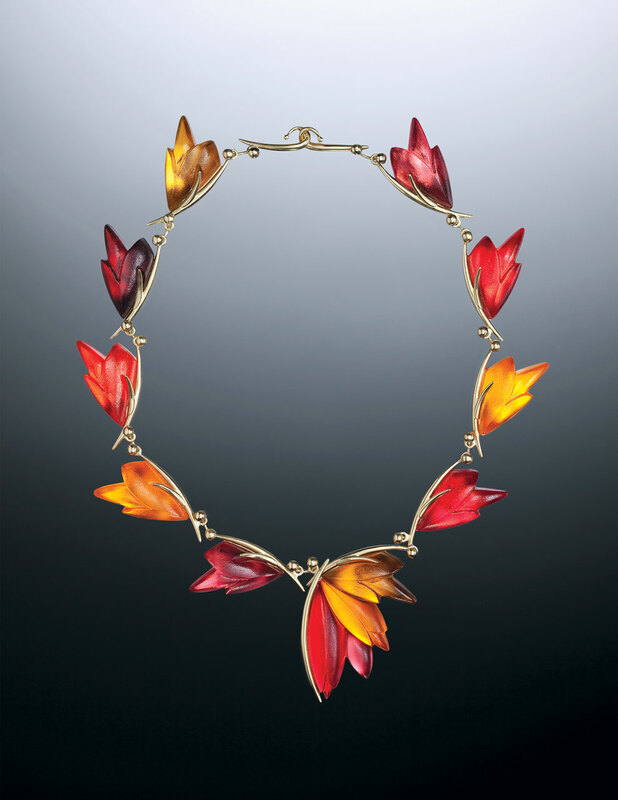 She began collaborating with a jeweler friend who taught her how to solder. Soon she was making a few pieces of her own and loved it. PREPARING the silver prior to soldering for Ivory and Red Constellation Necklace, 2015. Photograph by Kristina Logan. Logan never went to school for metalwork, but she knew enough to make the pieces she wanted to produce. If she wished to try something new, she would ask a friend—and sometimes her mother—how to do it. “I’ve always learned metalsmithing through osmosis,” she says. Formal training came from a few evening classes with the Australian silversmith Alan Place who worked for a time at Old Newbury Crafters in Amesbury, Massachusetts. In her thirties Logan “induced” arthritis in the cartilage in her left thumb from nearly non-stop beadmaking. Taken aback by the idea that one could wear out a body part at that age, she wore a brace for a while, but continued to work as hard as ever. Eventually realizing that she could no longer be a “bead machine,” Logan began making larger objects and combining glass and metals. Returning to her sculptural roots, to what was important to her as an artist, she needed to invest more heart into her work in order “to feel better about myself and not have my hands wear out.”At the same time Logan began to see the potential of beads as sculptural forms. 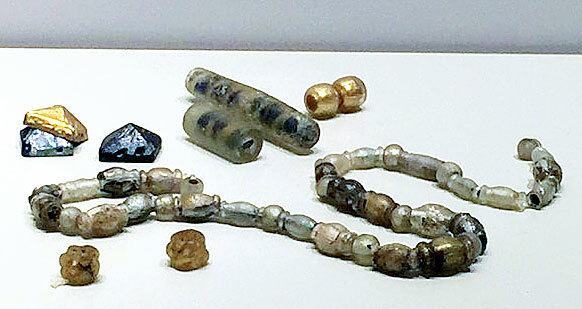 Individual beads could be resonant objects that people might carry around with them, like a Japanese netsuke or a marble—“a small piece that holds importance.” She came to believe that an object could be made so carefully that it could hold “spiritual content” without being attached to any specific religion. Logan’s totem beads, inspired by ancient African granite beads, epitomize this belief. She started out making them as handles for objects, but never made the actual object for the handle. While she has made a few brooches out of them, she feels they connect to the hand more than anything. KRISTINA LOGAN’S STUDIO, designed and built by Michael Graf. Photograph by Kristen Fuller. Asked about how she balances teaching with her artmaking, Logan estimates that ninety percent of the time she is working alone in the studio—“just me making”—with the balance spent leading workshops. In addition to instructorships at Haystack, the Corning Museum, Penland, and other schools and private studios further afield, she has started offering bead workshops at her new studio in Portsmouth. Being around other artists and interacting with students charges her up. In the workshop at Haystack, assisted by bead artist Priscilla Turner Spada from Newburyport, Massachusetts, Logan taught flamework technique—“all beads, all the time”—plus how to insert silver rivets in the bead holes. Seated before torches attached to three benches set along a wall of windows overlooking Jericho Bay, the students gamely wound the melting soda-lime glass canes around mandrels and listened as Logan shared the thought process that goes into creating her beads. IVORY AND RED CONSTELLATION NECKLACE of flameworked glass and fabricated sterling silver, 4.45 x 1.27 x 66.04 centimeters, 2015. Photograph by Dean Powell. “Bead people are passionate about beads,” Logan says. They understand the primal connection people have to these pieces of glass and how they are worn on the body. They also appreciate, as she does, the long lineage of beadwork in the cultures of the world. These beautiful objects bring people together “on a heart level.” That is the level to which Logan aspires, in art and life. Benesh, Carolyn L. E. “Kristina Logan. A Luminous Aesthetic.” Ornament 21.4: 42-45, 1998. DeDominicis, Jill. “Kristina Logan. Master Class in Glass Beadmaking.” Ornament 30.3: 64-67, 2007. Dubin, Lois Sherr. 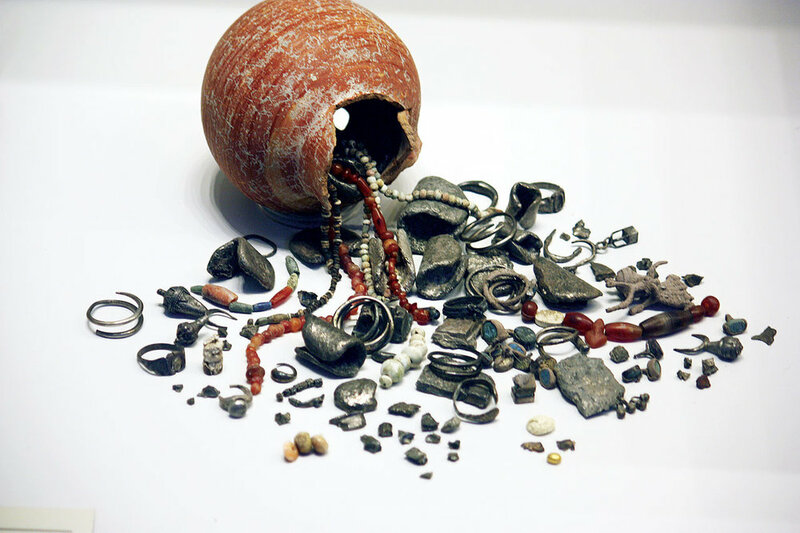 The History of Beads: From 100,000 B.C. to the Present, revised and expanded edition. New York: Harry N. Abrams, 2009. Hemachandra, Ray, editor. The Penland Book of Glass: Master Classes in Flamework Techniques. Lark Crafts, 2011. Jenkins, Cindy. Making Glass Beads (Beadwork Books). New York: Lark Books, 1997. Logan, Kristina. “Creative Process and Inspiration.” Glass Bead Evolution. International Society of Glass Beadmakers, Vol. 2, No. 2, 2014. Masters: Glass Beads: Major Works by Leading Artists. New York: Lark Books, 2008. 1000 Glass Beads: Innovation & Imagination in Contemporary Glass Beadmaking. New York: Lark Books, 2004. Carl Little caught up with Kristina Logan in late August at the Haystack Mountain School of Crafts on Deer Isle where she was teaching a workshop on glass beadmaking. Based in Portsmouth, New Hampshire, Logan is “the leading maker of glass beads working today,” according to David Whitehouse, executive director of the Corning Museum of Glass. Little is one of twenty poets featured in a series of videos produced during Maine poet laureate Wesley McNair’s tenure. They can be viewed on the University of Maine website. His most recent book is Wendy Turner—Island Light. THE BLUE DOVE NECKPIECE of torch-formed soda lime and dichroic glass, hand-fabricated, oxidized sterling silver chain; glass components sewn on with cable, 8 x 5 x 76 centimeters, 2015. Photograph by Robert Diamante. 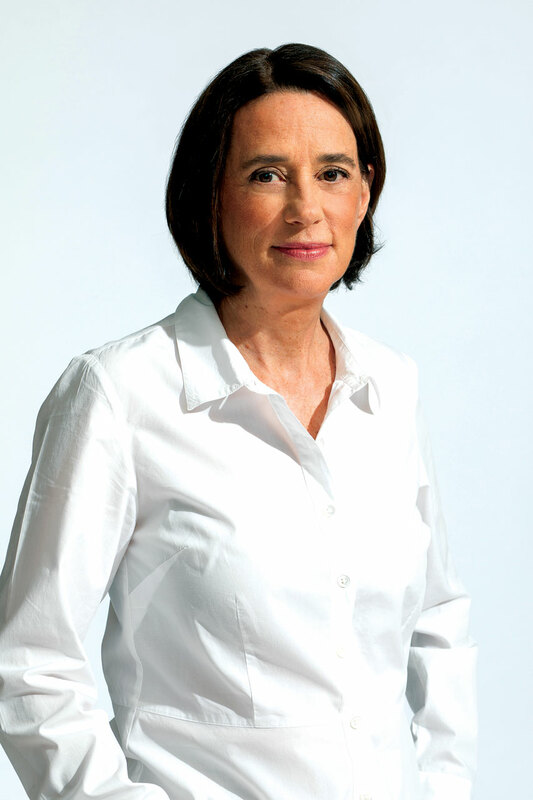 Ashley Callahan is an independent scholar and curator in Athens, Georgia, with a specialty in modern and contemporary American decorative arts. The University of Georgia Press recently published her book Southern Tufts: The Regional Origins and National Craze for Chenille Fashion. She met with Kate Rothra Fleming at the Atlanta Contemporary Jewelry Show. While their conversation included many topics—especially nature and antiques—that were not directly about Fleming’s work, Callahan was impressed by how successfully she distills her interests in little drops of sparkly, shiny, frosty, and wearable glass. CELTIC SQUARE KNOT, WOVEN PATTERN AND TREFOIL-DECORATED BEADS BY TOM HOLLAND, respectively 3.4, 2.9 and 3.4 centimeters high. The Celtic knot bead, also known as a Tibetan heart knot bead, took over an hour to make; the cross-hatching background contains eighty stringers of an inch and a half long, or ten feet of hair stringer total. Holland has made over sixty beads like this, with the same design on front and back, all of them exercises in muscle memory and heat control of the stringer. Photograph by Robert K. Liu/Ornament. Making glass beads has been my primary income for over two and a half decades. I employ many techniques, one of which is working with stringer, those fine strands of glass pulled from a small molten gather and applied in the flame of the torch to the surface of the bead. Eight years ago I started investigating cross hatching and its decorative potential. Some of the beads had a fabric look, so I tried to accentuate this effect. The idea of using glass stringer to mimic string sparked the idea of projecting knot patterns on the bead’s surface. While researching knot patterns and string history I came upon an article by Bednarik (2000), who pointed out the dependence of the bead on the string and knot in order to be an ornament. Without the string and knot, the bead is just an object with a hole in it. The purpose for any bead is to suspend it from someone or something. Here are a few things I have learned about the triad of the bead whose primary function is symbolic or spiritual, while the string and the knot’s primary function is utilitarian. Tom Holland, along with his wife Sage, has been contributing to the contemporary glass beadmaking movement through research of historical techniques and lectures. 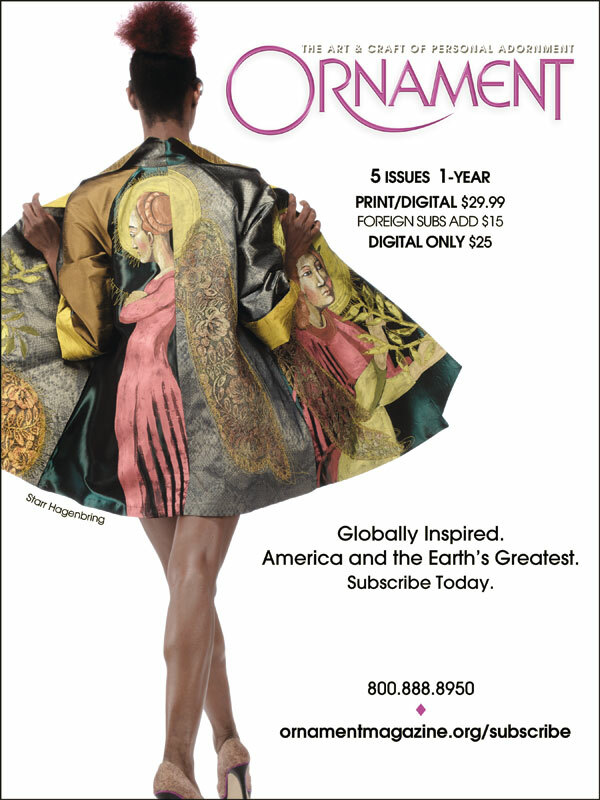 They have written articles for Ornament on Warring States and Islamic Period glass beads, taught internationally, as well as the United States and have been featured in many books and periodicals. 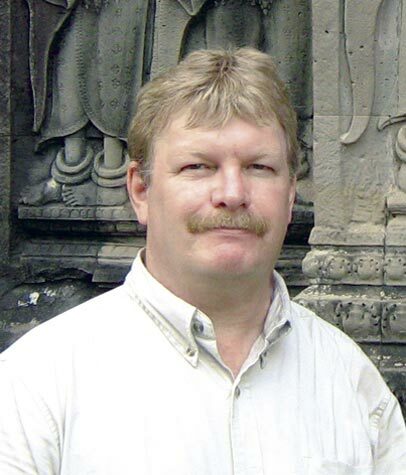 Holland will be making a presentation on the string, knot and the bead at the 2015 Gathering in Albuquerque, New Mexico. The couple found each other through their love of beads and continue to create glass art in the solar home they built in the woods of the Arkansas Ozark Mountains. Glass beads have spawned a fair share of maestros, but Art Seymour’s name is forever entwined with the chevron bead. 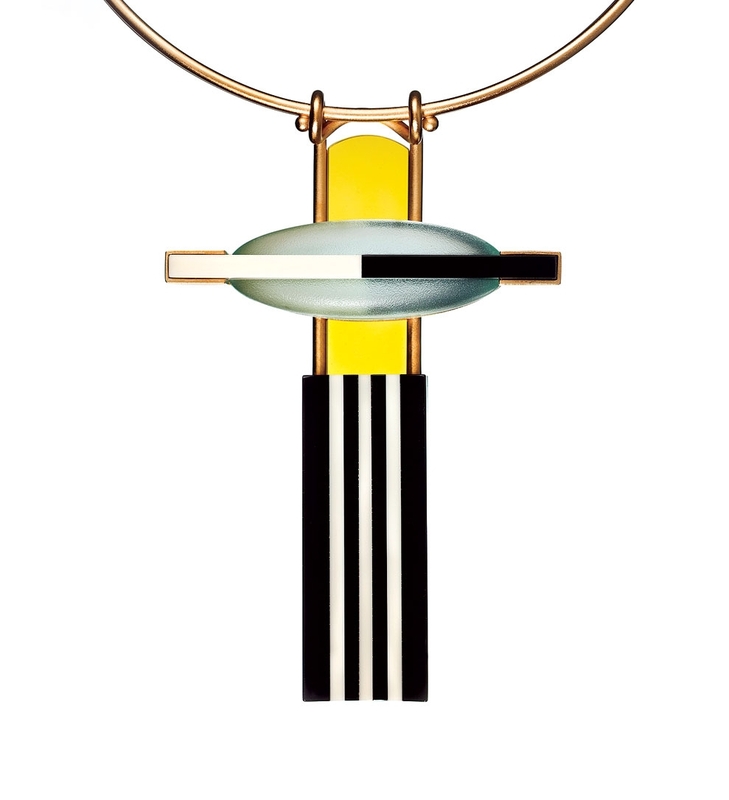 No other contemporary beadmaker has approached making chevrons of such quality. RINGS of ground Umaplex, 1980. Photograph by Tasas Kušcynskyj. Patrick R. Benesh-Liu visited this past summer with noted glass artist Svatopluk Kasalý where he lives and works in the small town of Trešt’ in the Czech Republic. The short but intensive meeting was an illuminating and refractive experience in itself. Through the lens of Kasalý’s work we find a sensual engagement with the world and a desire to improve upon it. Creativity, employed in this instance by Kasalý, adorns and expands ourselves and our environment, in a manner that takes the commodity of time and translates it into physical and material beauty. From the physical and material we are mentally inspired, and it is this joyous circle that Kasalý revels in.